The southern Pacific Ocean is bounded by South America, West Antarctica and Australia (Fig. 5.1). The morphology of the deep ocean floor, which lies at depths of about 5,000 m, shows three main basins separated in the east by a major submarine ridge (the Pacific-Antarctic Ridge which continues into the East Pacific Rise) and in the west by the New Zealand continental block. These basins are, from west to east, the Tasman Basin, the Southwestern Pacific Basin and Southeastern Pacific Basin. Complex morphology south of New Zealand defines the smaller Emerald Basin, west of Campbell Plateau, and East Balleny Basin, north of Ross Sea. 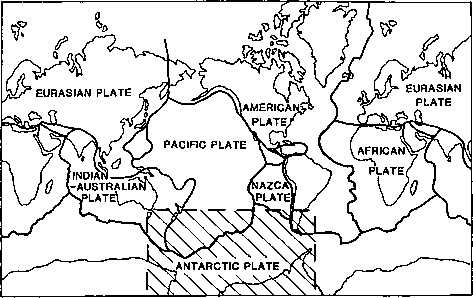 Major fracture zones (e.g., Eltanin Fracture Zone) offset the major oceanic rises. Oceanic trenches, reaching depths of up to 6,000 m, lie along the Pacific margin of South America and northern Antarctic Peninsula and along part of the Macquarie Ridge south of New Zealand. Continental shelves are narrow, apart from the broad shelves of the Bellingshausen, Amundsen and Ross Seas of Antarctica, with the other main shallow water area being the Campbell Plateau near New Zealand. This morphology of the southern Pacific Ocean and its margins has resulted from the geological development of the region during the past 150 Ma. The southern Pacific Ocean has evolved primarily as a result of the breakup and dispersal of the super-continent of Gondwana (Fig. 5.2). The similarities in geology of South America, South Africa and India led Suess (1909) to propose the existence in the past of a continuous continent which he termed "Gondwana Land". Wegener at about this time was developing his ideas on continental drift enabling the reconstruction of this super continent by reassembling the positions of Antarctica, Africa, South America, India and Australasia using geological and geomorphological constraints (Wegener, 1924). He considered that the fragmentation of Gondwana commenced in the late Mesozoic (about 100 Ma B.P.). Du Toit (1937) reviewed and developed the evidence and theories associated with continental drift and reconstruction. He noted the position of Antarctica as the 'key piece' of Gondwana, the drift northwards of the surrounding continents and the pre-breakup continuity of the late Palaeozoic Samfrau Geosyncline, or orogenic belt, along the Pacific margin of Gondwana. The process of breakup and dispersal of Gondwana, with various continental fragments breaking away at different times, can be described in a coherent fashion by means of the theory of plate tectonics. This theory also helps us understand the tectonic development of both the southern Pacific Ocean and the continental margins bordering the Pacific. Fig. 5.1. Morphology of the southern Pacific Ocean and its margin. Contours are water depths (km) (Polar Stereographic projection). Fig. 5.2. Gondwana showing the age of separation (Ma) of the continents from Antarctica. The Samfrau Geosyncline (Du Toit, 1937) is shaded. crust, about 5 km thick, and continental crust, about 35 km thick. These are underlain by a more ductile rock layer termed the mantle. The two types of crust correspond, in general terms, with the deep ocean basins and with the continental land areas respectively. 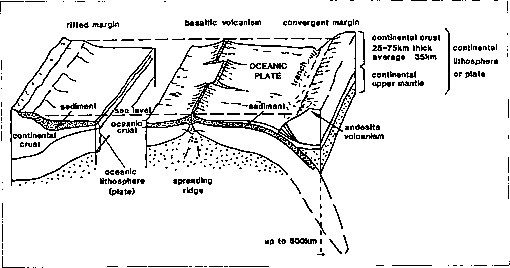 In plate tectonics, the surface of the earth is considered to be formed by several thin (5-60 km) rigid plates (Fig. 5.3a). These plates consist of the crust and uppermost mantle (lithosphere) and are moving relative to each other (Fig. 5.3b). Where the plates are moving apart, a spreading centre (or ridge) is formed at a boundary where new hot, mantle-derived, rocks rise to the surface and solidify to form new oceanic crust (e.g., Pacific-Antarctic Rise). Three spreading centres may join to give a 'triple junction' which is a stable spreading configuration. In the regions where plates converge, one plate is usually thrust under the other and descends to depths of up to 600 km. This underthrusting is referred to as subduction. Where this type of plate boundary occurs, a trench is often formed with uplift and volcanic activity occurring in the adjacent overlying plate close to the boundary (e.g., Chile Trench). However, if continental crust occurs at the convergent boundary, the crust tends not to subduct but to crumple up forming mountain ranges (e.g., Southern Alps of New Zealand). If the rate of formation of new crust at a spreading centre is slower than the rate of consumption (subduction) at the adjacent plate boundary, then the spreading centre will migrate to the trench (subduction zone) and the system will ultimately die. Where the relative plate motion at the boundary is parallel to the boundary, a transcurrent boundary is formed. Fig. 5.3a. Major lithospheric plates (Mercator projection). 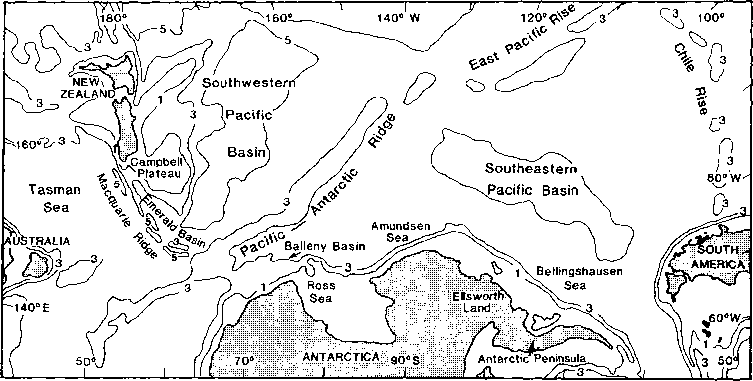 The Antarctic Sector of the Pacific Ocean is outlined by heavy dashed line. Fig. 5.3b. Schematic diagram showing the mechanism of seafloor spreading. The rifting processes coinciding with the onset of a new spreading centre typically start with an upwelling of hot mantle rocks under continental lithosphere, the heat leading to uplift and associated erosion. As the process continues, major block faulting occurs along the line of the increased heating giving rise to major continental rift structures, such as the East African Rift, with associated crustal stretching and thinning and downwarp of the land surface. Eventually, the stretching of the continental crust reaches its limit and molten mantle rocks rise to the surface, cool and solidify to form new oceanic crust. The time between the initial heating, uplift and continental rifting and the first intrusion of new oceanic crust may take many million years. 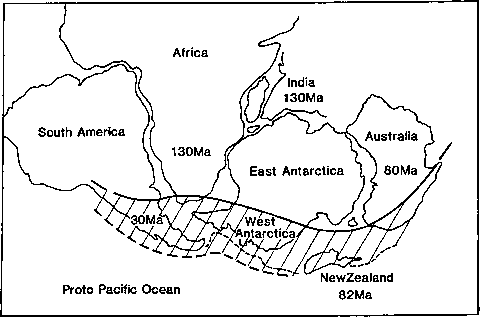 The Pacific margin of Gondwana consisted of the continental blocks now forming South America, west Antarctica (Antarctic Peninsula, Ellsworth Land), and New Zealand (Fig. 5.2). Convergent plate margins occurred along this region prior to the Cretaceous (100 Ma B.P.) with the oceanic Pacific, Phoenix and Farallon plates being underthrust under the Gondwana continent. In Jurassic (150 Ma B.P.) 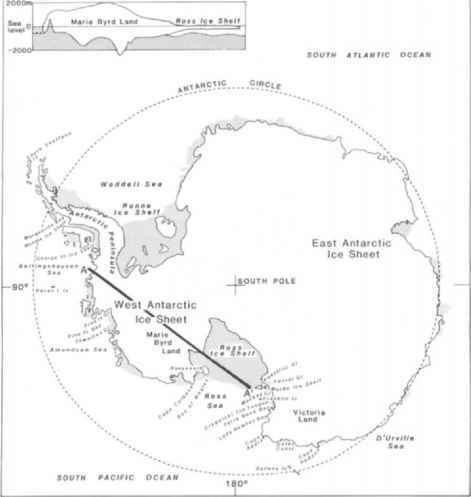 and possibly earlier times, rifting processes started to occur along most of the present Antarctic margin resulting in the breakup of Gondwana and the isolation of Antarctica. Oceanic lithosphere started forming about 130-150 Ma ago between South Africa/India and Antarctica and about 80-85 Ma ago between Australia/New Zealand and Antarctica. The South America/Antarctic Peninsula/Ellsworth Land margin of Gondwana remained a subducting convergent margin during this period with subduction ceasing in Oligocene times (30 Ma B.P.) along Ellsworth Land and at successively younger times for the margin eastwards along the Antarctic Peninsula. The present oceanic lithosphere of the southern Pacific Ocean was therefore produced by seafloor spreading over the last 85 Ma, associated in part with the rifting of New Zealand from Antarctica. In the eastern part of the southern Pacific Ocean, the continental margins coincide with convergent plate margins whereas, in the western southern Pacific Ocean, the continental margins are dominantly passive margins arising from rifting of continental lithosphere during the past 150 Ma.